matt, v. mat. 1. to act in a manner that is discomfiting to oneself and/or to another or others, esp. upon first meeting. 2, colloquial, Zambia circa 2013. to meet somebody and then proceed to be painfully, spectacularly awkward. It’ll be in the OED by 2015. My goal for yesterday was ambitious: I needed to charge my second phone. There are two major cellular networks in Zambia, Airtel and MTN, and I have a phone for each in case I’m in an area where one works but the other doesn’t. However, I don’t have the proper adapter to charge my Airtel phone using my solar panels. So I decided to bike a few kilometers to Kampampi, a small town nearby – really just an intersection with a few shops – and find some amalaite. I cruised in and on my second try found a shopkeeper who agreed to charge my phone for one kwacha. Perfect. But what would I do until it finished charging? Beyonce projected throatily from the speakers next door. Also some early Destiny’s Child. I approved. Several of the brothers’ friends kept slouching in and out on this lazy Sunday afternoon, skulking young men whose narrowed and unsmiling eyes lingered on me. Showing that I couldn’t be intimidated, I asked them confidently what their names were, if they were married, and what their fathers did for a living. That sure showed them. At one point they all started eying my bike and talking animatedly in Bemba. I couldn’t understand much more than incinga (bicycle), but I was pretty sure we all knew that seven is more than one. Maybe they were arguing over which of them got to keep it. A small TV was playing a karate movie from the ’80’s in the back and a crowd of children were clustered in front of it, mostly ignoring me. A first. I peered over disinterestedly, feigning a casual dismissiveness like any true martial arts master would upon seeing the slowed-down-for-moviegoers version. I flexed my forearms nonchalantly. Meaningfully. Time crawled ponderously, then decided to give up and sit down. More of those big-picture thoughts. Damn it, why do people here keep thinking I’m a woman? I don’t look like a Zambian woman OR an American woman. I’m not even wearing my skinny chinos! Hmm, looks like that pullup bar is paying dividends already. As it turned out, they were not plotting to steal my bicycle. Though I think I was asked to give it to them at more than one point. After more waiting, more awkwardness, and more big-picture thoughts, time finally and mercifully began lurching forward again. I got my phone back fully charged, finished my Pepsi (ugh, the sugar leaves a weird aftertaste in your mouth and a throbbing in your head), issued farewells to my partners in loitering, and rode away deliberately and unconcernedly, as if I could have stayed the entire afternoon. 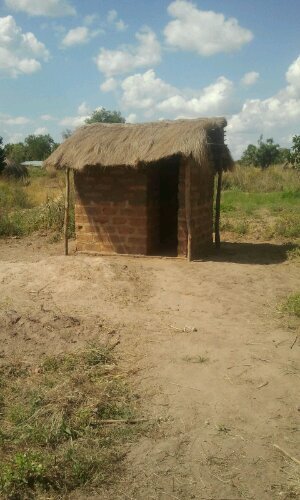 As I sit here in my mud hut in Zambia typing a blog post into my smartphone, I realize with no small irony that I’m in the strangest land I’ve ever known. However, I’m not visiting this strange land. I live here. The source of my awkwardness is not in trying to visit the place but in trying to know the people. To try to behold the universes of the people in my village, the universes that they behold and the universes that they are. And in so doing, to try to effect our own voyage of discovery together. People live in mud huts with grass roofs in rural Zambia, but this oversimplified description is a bit misleading. 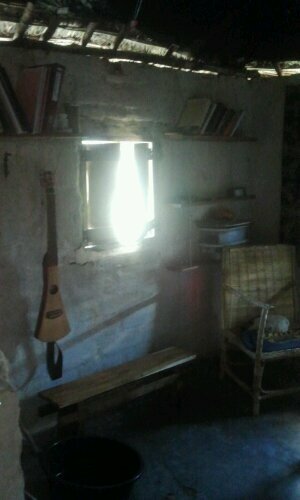 The hut I imagined I’d be living in before I arrived here conjured images of Little House On The Prairie. My actual house is more like, well, like a house. Yes, the walls are made from dried mud bricks and clay mortar, and the roof is comprised of thatched grass tied to tree branches using twine, but Laura Ingalls would be lost in this “hut.” My home has four rooms and a hallway, which means it’s huge by both Peace Corps volunteer and local village standards. A few of my neighbors have houses this big, but they also have a dozen people living inside. For one person, this place is a veritable mansion. The first room to the left when I walk through the front door is my living room/general purpose room. This room has the most windows (two, one double-sized), the best lighting, and is the only room that is completely limed, painted with a lime/salt/water mixture which protects against insect damage and gives the walls a white color, so I spend most of my time in here. I collect chitenges with fish on them and chitenges with patterns that remind me that I’m in Africa. 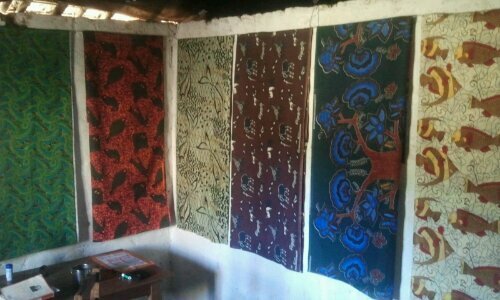 They vary in price depending mostly on quality and a bit on how willing a shopkeeper is to bargain; I buy the cheap nylon prints for K7.5-K10 each, and the heavier, softer cotton fabrics cost anywhere between K15-K25. The premium, cream of the crop Congolese chitenges are made from heavy waxed cotton and will run you K30-K35. The first room to the right is my kitchen. 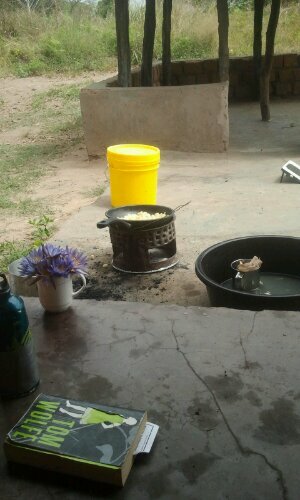 This is where I prepare food, cook on the brazier (though I usually light it and let the coals heat outside), and wash my hands/dishes. I installed the running line and hooks for easy storage of pots, pans, vegetables, dishrags, and cooking utensils. Perishable foods go into two large plastic buckets like the one pictured beneath the table. I draw and carry water using three five-gallon buckets like the red one in the foreground. The custom food prep table is my new baby. I gave the carpenter exact dimensions because I wanted a table tall enough to chop vegetables on while standing, a shelf underneath for food storage, and enough space beneath the shelf to stow one of the big storage buckets but with a narrow clearance so that my resourceful cat can’t pop the lid off. The table was ready in two days, exactly to specification. Wish I could give him a 5-star review on Yelp. On the opposite side of the kitchen is a bookshelf I bought from the Peace Corps provincial house in Mansa before posting. 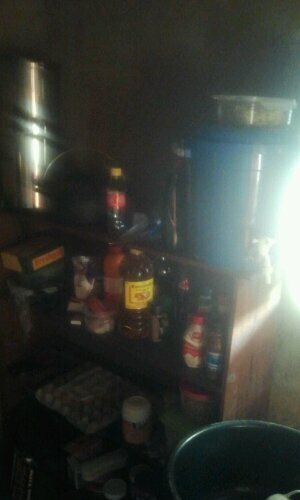 On top are my water filter and washing bucket for easy access while standing, and the shelves hold spices, oils, and other nonperishable foods in sealable containers. I have plastic bags hanging from nails in the wall to the right of the picture for garbage (goes in a pit outside), compost (I dump it on the patch of dirt where I entertain wistful notions of starting a garden), and ash (can dump it down the chimbusu to cut down on smell/flies, and also makes good fertilizer for fish ponds). 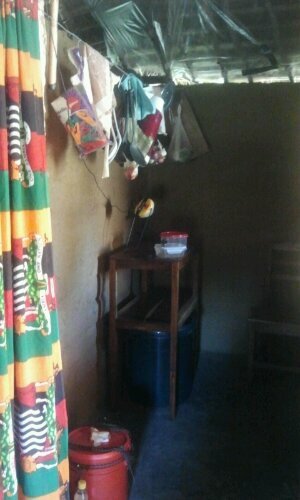 The short hallway is separated from the front two rooms by a sliding curtain made from a chitenge that I took to a local tailor, strung across a wire I nailed over the top of the entryway. A vestibule opens to the right (just behind the kitchen) where I store my bike and 50kg bag of charcoal, and from the vestibule is the opening to my indoor bathing shelter (most volunteers have outdoor bathing shelters) and storage area where I’ve strung ropes and wires from the rafters for hanging luggage, clothes I don’t wear on a daily basis, and other miscellaneous gear. I put up maps on one wall of the hallway, with a string stretched across for hanging cards. 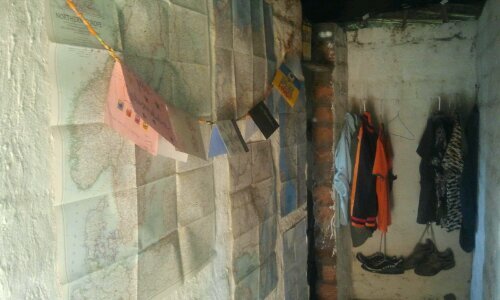 The back of the hallway is an open closet with shirts/trousers on handmade clothes hangers hanging from a wire and shoes hanging from nails in the back wall. My overarching goal for home improvement projects was to get everything off the ground. 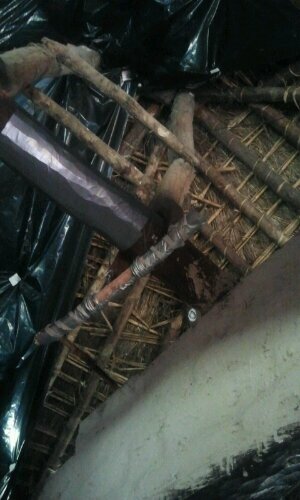 In the hallway I made a pullup bar from wire, a tree branch, and duct tape, hung from the big center rafter. I have plastic tacked up over the inside of most of the roof, with only the vestibule/bathing room/storage room uncovered. My bedroom is simultaneously the most sparsely furnished and most expensive room in the hut. Why? Mattresses are relatively expensive here in Zambia for the quality you get. This foam mattress ain’t no Tempur-Pedic, though if you sleep in the same place long enough without flipping it over it will create a dent in the shape of your body. And bed frames, though very reasonably priced for the amount of raw material and labor that goes into making them, still relieve your wallet of a lot of kwacha. 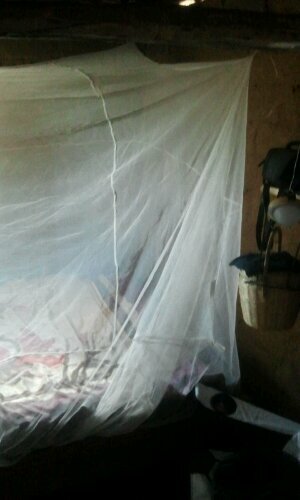 Full-sized bed (K280) with mattress (K500) and mosquito net (provided by Peace Corps). I built another hanging shelf near the bed for use as a nightstand. 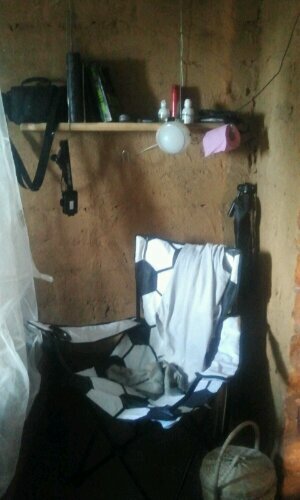 Underneath is a folding armchair soccer-mom style from the ShopRite in Lusaka and a wicker basket I bought from a guy on a bike in Mansa which I use for storing socks and underwear. Just out of the frame is a thick blue chitenge rug made by a woman on the side of the road in Kashikishi. Yet another use for wire – make a toilet paper dispenser! I had a bright idea the other day: putting my cat up on top of the wall would be a great way to keep her away from my food. Every time I begin to cook it activates a little white furry homing beacon: within five seconds Hobbes comes flying into the kitchen, mewing and purring and trying to separate a piece of bread or soya from the pack in order to move in for the kill. It’s not like I don’t feed her. I buy cisense exclusively for Hobbes’ consumption (cisense, n. chih-sense-ay: small juvenile fish of multiple species, harvested from streams and lakes typically with mosquito nets, dried and sold on the side of the tarmac; local price is currently K1/cup), and I already feel not a little guilty that my cat gets fed more protein than 75% of the kids in my village. Yet this pampered pet prefers to nibble on the fresh-baked bread I buy from the tuck shop at the school. Three days ago she nibbled right through a Ziplock bag. Iwe, I brought these with me from America, I complained. She ignored me, clearly failing to grasp the significance of from America, that highest tier of Peace Corps Zambia volunteer possession rankings which simultaneously represents both quality and scarcity (from Lusaka is next, followed by from the boma, then in the village, and finally sheepishly bringing up the rear is I made it myself). I can rattle off all of the prized possessions I brought with me from America in 7.8 seconds. I glared at her. She yawned and closed her eyes, filing her own grievance with a dismissive meow. Picking her up and tossing her out of the room isn’t a very effective deterrent – she just grumbles and wanders back in. But from the top of the wall, a curious kitten has free reign over a veritable maze of walltops and roof support branches, a new world rife with opportunities to satiate even the most inquisitive of felines. Meanwhile, I can cook and eat in blissful peace without an obstinate Hobbes sticking her nose in every single place I don’t want to see it. Once I’m done cooking, I’ll just lift a disgruntled cat back down and she’ll be none the worse for wear. Mwila sakamana. No worries. 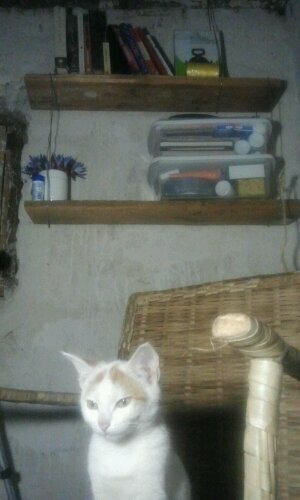 I lifted my protesting, squirming kitten up onto the living room wall. Tentatively she began to explore her new surroundings. We’ll see how long it takes you to find your way down, I told her, immensely pleased with myself. 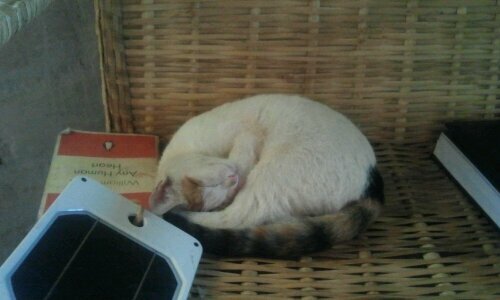 Ten minutes later: a muffled crash from the back of the hut, a loud meow. Hobbes trots back into the living room and makes a beeline for my plate, purring like a V8 engine. Sigh. Back to the drawing board. At the beginning of Pre-Service Training we were given a worksheet entitled, “Cycle of Vulnerability and Adjustment.” On it was a T-graph depicting how periods of vulnerability and adjustment change over the course of the 27 months of one’s Peace Corps service. Over the first three months in country, the emotional roller coaster ride represented by the line on the graph goes through more peaks and valleys than the John Muir Trail. Vulnerabilities are discovered and the ride drops, and as adjustments are made the ride climbs back up again. Still other vulnerabilities are recognized and the corresponding adjustments made – more valleys and peaks. But then a funny thing happens at the end of month 3: the roller coaster begins a long, steady drop into the realm of vulnerability. What happens to cause this plummet? The newly sworn-in volunteer arrives at site. Commence emotional and mental swings like a pendulum from hell. First thought: I’m overwhelmed. It seemed like the entire community numbering more than fifty people was waiting to greet me when the Peace Corps Land Cruiser (helmed by Luapula Province’s rockstar PGSA Ba Manowa) crashed up the short bush path from the tarmac into the middle of the village last Friday. Granted, the mere presence of a vehicle in the middle of the village, any vehicle, is cause for much wonder and speculation, but this was no ordinary check-out-the-motoka crowd (sound it out slowly – a lot of words in Bemba are corrupted from English). This was a crowd befitting of a let’s-not-miss-the-arrival-of-our-new-very-own-personal-muzungu show. And what a show it was. 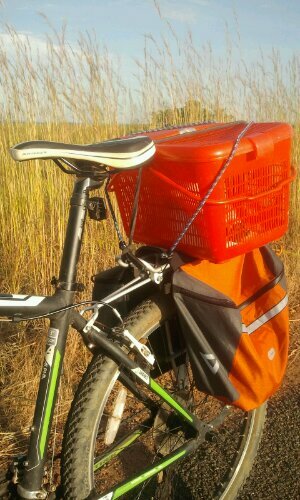 The Cruiser lurched to a halt, stacked high with bed frame/luggage/wicker chair/storage buckets/bookshelf/bicycle! two muzungus stepped out of the back of the vehicle like movie stars wearing sunglasses and beards and broad grins and started high-fiving all of the iwes! (David and Stefan, two other volunteers along for the ride.) then came a muzungu woman, smiling and waving! (Siobhan, our fearless PCVL/my extremely patient babysitter for the week of posting.) then last of all was the muzungu, the one who’s not from China and not a woman but who looks like he’s from China and looks like a woman, taking pictures with a huge silver camera! I’m kind of a big deal. People know me. It’s flattering at first, but this ego boost lasts approximately fifteen seconds and then is replaced by a weary wariness which comes from being constantly watched. Second thought: I’m really overwhelmed. Imagine a fish. It’s a pretty small fish, but it’s had a good life, is reasonably intelligent and self-aware. It does enough pullups to show that it cares about physical fitness but not so many as to imply narcissism and an unhealthy preoccupation with physical body image. It dabbles in guitar playing, writing, cycling, cooking, backpacking, has intelligent if a bit indiscriminate taste in books and movies and music, favors a minimalist design style, is partial to a good pair of tapered-leg chinos. Imagine that this fish suddenly finds itself living in a fish bowl, with clear glass on all sides. Imagine that this fish bowl is in a second-grade classroom full of bright-eyed, eager, curious young scholars who want nothing more than to know everything there is to know about this fish. Imagine the stares, the excitement, the joyous laughter, the noses crowded around the bowl all crammed together like a sea of hovering alien spaceships, the smudged fingerprints on the glass. Imagine how the fish, exhausted from the constant effort of being alert and on display and acting in a culturally appropriate manner, darts into the small plastic castle in the middle of the fish bowl. Imagine how the fish must feel as it flits back and forth nervously inside the perceived security and isolation of that tiny castle, wondering why it is here and if it will ever become used to this and what it is going to do with its life. Imagine that it knows it will be living in this bowl for two years. Imagine that it thinks two years will feel like an eternity. Now picture a pristine alpine lake high in the Sierra Nevada. Picture sapphire blue waters shimmering with sunlight reflecting off the towering granite crags above. Picture the water, cold, clean, still. So still. Picture a quiet so quiet that you could hear a pin drop, except there is no pin to drop, because there is nobody else there to drop it, there is only the steady and deliberate beat of your own heart, at peace. Picture vibrant trout erupting above the surface with showy splashes in pursuit of grasshoppers, struggling to break free from the water’s sticky film. Something tells me that the fish in the fish bowl has extensive, vivid dreams about that High Sierra lake. Third thought: home improvement is chicken soup for the displaced American’s soul. I’ve spent a large chunk of time working on the house, from hanging chitenges gallery-style in the living room to installing a wire for hanging pots and pans and cooking utensils in the kitchen to nailing wire mesh over each of the windows. Outside these four walls, I’m still the new muzungu who everyone watches intently in every part of my daily life to see what muzungus do. 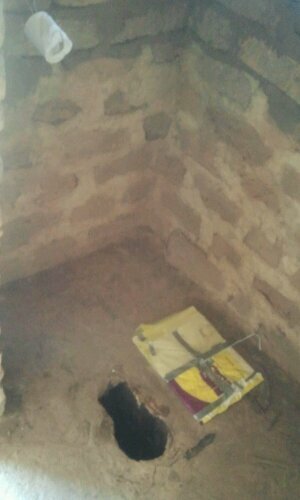 Inside these walls, I’ve discovered that 8mm wire, duct tape, and fish-themed chitenges are the most valuable tools at the disposal of a budding Zambian homemaker. And I’ve also realized that the time I’ve spent decorating and installing shelves/curtains/hangers are an emotional salve more powerful than having someone to love you unconditionally and shower you with affirmation. Thanks to my needy little kitten who mews plaintively when I haven’t looked at her in the past ten minutes and whose favorite place to sleep is wherever I happen to be at the moment (nestled on my lap in the wicker chair in the living room, curled up at my feet on the thick chitenge rug in my bedroom as I sit and journal, wedged into the corner of the bed as near to my pillow as the mosquito net will allow her), I have both. I think I’ll be fine. -I didn’t realize how much I missed Reese’s peanut butter cups until I plopped a dollop of peanut butter into a mug of hot chocolate this evening. I can buy practically anything I could ever want in Lusaka, but one of the few things they don’t have in Zambia is also one of the things I like most of all in America: chocolate peanut butter cups. Never mind that hot chocolate when it’s so warm that my forehead is glistening with sweat (not half an hour after I bathed – I’m going to literally die in the hot season) isn’t exactly the best idea in the world. I was determined to try to recreate that magical taste. It wasn’t bad. It also wasn’t Reese’s. – A young guy of indeterminate age (Zambian 30-year-olds look 15, and 15-year-olds look 30) ambled up to me while I was cooking one evening and uncharacteristically for a Zambian began asking me persistent questions in Bemba. I humored him at first, answering as best I could while continuing to watch the pot of rice. He kept on the same topics though, first asking me to give him food, then saying something about where he lived, then asking if he could (I think) live in my house with me. By this point I was pretty sure he was drunk, even though my drunk radar took longer than usual to ping because the guy looked prepubescent, and my patience was wearing thinner than the t-shirt that the mosquitoes were industriously drilling through. I threw on a hoodie and swapped bug bites for a thin layer of sweat all over my upper body. I was still holding out on using “fumeniko” (it’s an imperative that means leave, with respect), and wasn’t going to play the “fuma, iwe” (leave, completely disrespectful) card unless absolutely necessary. After about fifteen minutes had passed though, the headman of my village made a beeline for us. I have no idea if he was summoned through the grapevine of village gossip – quick, the muzungu is being harassed! – or if he saw what was going on from his place a few houses down, but he fumeniko’d the offender and a companion who had joined him right quick. I gave him a grateful “Natotela, Ba Headman,” (still don’t know his real name) while reassuring myself that I had the situation under control. I returned my attention to the rice and found that it had burnt. Wonderful. -It took less than 24 hours for me to turn into a cat person. Thanks for all of the great name ideas, wish I could have chosen more than one! When I first picked up Hobbes (née Chuck Norris – Sarah likes to pick names that the kids in her village will know; sibling Michael Jackson was already delivered to a volunteer in Mansa District), she was distrustful and spent the first hour in my hut cowering beneath my bed. After being trapped in a basket on my bike for several bumpy kilometers, I can’t say I blame her. However, we’re swiftly becoming inseparable. Literally. She follows me around like a little kid when I walk from one room to another, and right now she’s curled up on my wicker chair beside me listening to country music and hungrily eyeing the moth flitting about overhead. She chases everything that moves and some things that don’t, like the eagles on the bottom of the Zambia coat of arms chitenge that I hung up on the living room wall. 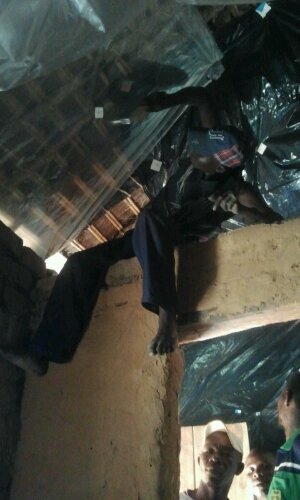 -I spent most of the day supervising the installation of plastic on the inside of my thatched grass roof. This is supposed to come standard in PCV huts, but it wasn’t done when I arrived and this is the kind of thing you’d optimally want to get done before you unpack and your hut looks like it was hit by a tornado. Hammering nails into wooden logs tied to dried grass will unleash a shower of dirt to make a Dyson shriek with fear and promptly bite the dust you paid an exorbitant amount for it to vacuum. So I mentioned to Ba Sebastian, my counterpart/host/guide/contractor, that I needed to get this done soon and was willing to pay. Not an hour later he showed up at my hut with four guys in tow. He pointed to one of them and told me he’ll do my roof for K10. That’s two bucks. For four hours of work. And this was a good gig, considering a day’s labor is worth about ten kwacha in this area. Sometimes I forget where I am and something like this jolts me back. While Ba Spiderman was at it, I also asked him to tie my solar panels up to the top of the roof and string the cords down through the thatching so I can have a built-in system for charging my lights, phone, headlamp, and speakers. 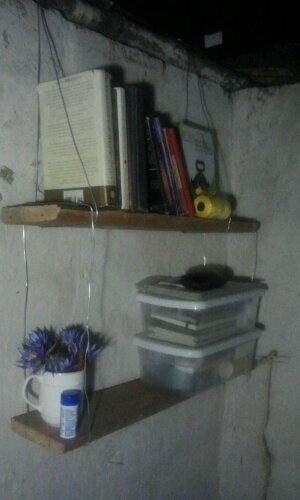 Earlier in the day, I installed a clothesline in my bathing shelter and made a hanging bookshelf from two parallel planks about 16″ apart, suspended from the wood rafter branches by wire. And over the last few days I’ve also installed a pullup bar, made clothes hangers, and put up nails and wires everywhere for hanging things. I’m not the DIYer type, but give someone enough free time, not enough furniture, and enough reasons to get stuff off the floor (dirt, rats, snakes, curious kittens) and he’ll come up with something. Contest: name Matt’s new cat! Leave a comment below with your best guess! I’m a fan of quirk, non sequiturs, and cute randomness. I’ll choose my favorite name within a few days and your prize will be knowing that your brainchild will be keeping me company for (hopefully) the next two years. 1. None of this “you need to know the animal before you can name it nonsense.” I’m a believer that the soul becomes the name, not vice versa. My parents named me long before I popped out, and I’m probably the Mattiest Matt you know. 2. You can submit multiple possible names. This is really just a cleverly disguised admission of a lack of imagination on my part. Ingenuity is borne of desperation. The other night, with the three of us yet-to-be-posted volunteers running dangerously low on kwacha and needing to scrounge together a meal on the cheap, we conducted an experiment to see if we could make a dinner using only the house food supplies (certain basic food staples like rice, flour, spices, and sugar are paid for using the house fees that volunteers pay when they come to stay at the house). We had at our disposal a pumpkin, a few eggs, a few odd leftover vegetables, and lettuce from the garden. From this eclectic assortment of ingredients we cobbled together an unlikely meal: Ryeon whipped up a batch of pumpkin pancakes, Michael excavated the seeds from the pumpkin and burnt roasted them, also assembling a salad with balsamic vinaigrette, and I took everything else and threw it into a skillet and ended up with curry pumpkin fried rice. The meal was startlingly good, and we even had enough leftovers for breakfast this morning. For the past week I’ve been living at the Peace Corps provincial house in Mansa, waiting to be posted to my site in Nchelenge District. It’s been an interesting few days, mostly because it feels so different. Different from both Pre-Service Training in the quickly receding past and from Community Entry in the imminent future. Apart from shopping for getting posted to site and a few informational meetings with local government officials, most of the time that I’ve been here has been mine to do with as I please. This starkly contrasts with the highly structured, summer camp-esque programs of PST we were shepherded through for the past three months. What to do with all of this free time? Well, I’ve watched a lot of movies, listened to a lot of loud music (and had a few impromptu dance parties), eagerly scanned TrueReddit to catch up on news articles and essays that I’ve missed, geeked out with photo post-processing, and eaten a huge variety of foods. Oh, and I’ve practically camped out in front of Facebook every day since acquiring the internets. May as well air out all of my dirty laundry while I’m in self-disclosing mode. I find myself amazed at how quickly I can revert back to a lifestyle so remarkably similar to my daily life back in America. Scene: The day is Wednesday, May 8, 2013, the time is 22 hours. I am sitting on a couch, watching Stand By Me, exchanging surprised noises of recognition with Siobhan and Ryeon when a young John Cusack appears on-screen, laptop perched on my knees, sneaking glances at the day’s baseball scores on ESPN.com. Dorkus, the house cat, brushes up against my leg and then continues on, prowling for his next hapless victim. It’s like I never left home. It feels as if the past three months of living in a one-room mud hut with monstrous spiders on the walls were just a dream. And then I look ahead and acknowledge once again what I’m too pragmatic to ignore but too emotionally self-regulating to allow myself to dwell upon – I’m about to move into my site, a place where I will be the only white person living for several kilometers in every direction. A place where I am openly stared at and laughed at and talked about when I walk down the tarmac. A place where I will be drawing all of the water I need to use for drinking and cooking and washing and bathing from a well by hand, and cooking all of the food I will eat over a brazier with charcoal lit by matches. A place where half of the people who see me think I am a woman, where nearly everyone thinks I come from China, and where I do not feel even remotely at home. At least, not yet. It seems scary. I should feel scared. Perhaps I am. Perhaps I deal with fear by ignoring it. By rationalizing it. By talking about it directly while appropriating an attitude of casual detachment and flippant self-disclosure. Hell, I don’t know. The logical, pragmatic side of me is hovering at my ear, arguing that there’s no point in worrying about something that will happen in the future when you can just tackle it when it comes. The thinking, analytical side of me rifles through the worn pages of my memory, searching for pertinent bits of information to usher to the front of the que as it chatters nonstop about to-do lists and constantly monitors my pulse for levels of stress (low), anxiety (very low), and fear (not getting a clear reading). The feeling, emotional side of me is silent, waiting for the pulse-taker to finish collecting data before deciding upon a course of action. It’s seen this all before. But if I lean in and listen intently, I think what I’m feeling is a quiet sort of restlessness. I’ve seen nor felt nothing that will fully prepare me for the journey I’m about to embark on so I’m uncertain what to think or feel. Right now, at this moment, I’m sitting at the dining room table in the Mansa prov house, alone with my computer and my thoughts. The house is empty. The Land Cruiser carrying me and all of my clothes and food and house supplies will leave in a couple of hours. My mind wanders. Yesterday I made a couple of experimental clothes hangers out of a ring of 4mm wire I bought from the hardware store earlier in the week. If I can make more than four hangers out of the K15 wire, it’ll be cheaper than buying hangers from PEP or Shoprite. Sure, making hangers takes time and there is an opportunity cost associated with that time, but here in Zambia and in the Peace Corps that opportunity cost is much lower than it would have been in the States. “I sleep late, fish a little, play with my children, and take a siesta with my wife. In the evenings, I go into the village to see my friends, have a few drinks, play the guitar, and sing a few songs … I have a full life,” the fisherman responded. “Millions? Really? And after that?” the fisherman asked. If I lean in and listen intently, I think I simply want the waiting to stop and the living to begin. And that I want some more of that pumpkin fried rice.